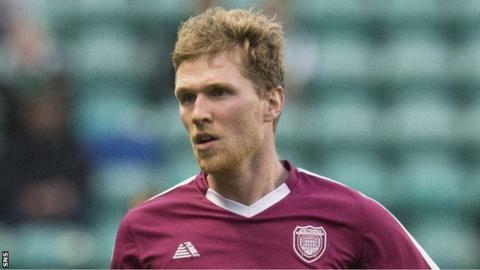 Arbroath stretched their lead at the top of Scottish League One to 16 points by beating nearest challengers Raith Rovers. Colin Hamilton struck the only goal in the first half at Stark's Park. Third-placed Forfar Athletic missed the chance to go above Rovers after losing 2-0 to Montrose. Dumbarton leapfrogged Stranraer into eighth place with a 3-0 win at Stair Park and Brechin City beat Airdrieonians 1-0. Arbroath had lost to their hosts on their home ground the last time the sides met in December and travelled to Kirkcaldy having failed to win in two games, both at Gayfield. But Rovers too had stumbled in recent weeks and slump to a fourth game without a win thanks to Hamilton's low drive - the defender's fourth goal of the season. Montrose are three points outside of the top four after Craig Johnston's shot in the first half and Martin Rennie's penalty in the second secured them the three points against Forfar, who had Dale Hilson sent off for a second yellow card late on. Ross Forbes' strike gave Dumbarton a second-half lead over Stranraer and the hosts' hopes deteriorated when Andrew McDonald was sent off for two bookings. Dom Thomas and Ross Perry fired further goals for Jim Duffy's side, who moved out of the relegation zone on goal difference. Andrew Jackson's first-half goal proved to be enough for Brechin at the Excelsior Stadium. Neither fourth-placed East Fife nor bottom side Stenhousemuir were in action as the Fifers had played and lost their Challenge Cup semi-final against Ross County on Friday evening.